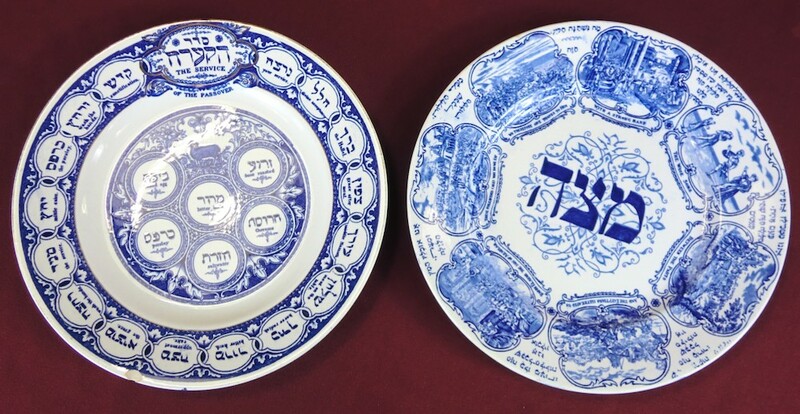 The two white Passover plates in this photograph feature blue artwork and embellishments. The one on the left has a traditional Passover Seder plate image in the middle and the order of the Passover meal around the edge. The other on the right has the Hebrew word for matzo in the centre with images of the Passover story around the edge along with the Hebrew words, "Ma Nishtana"—'the four questions’." The Passover Seder, meaning "order, arrangement", is a ritual feast that marks the beginning of the Jewish holiday of Passover. It is conducted on the evening of the 15th day of Nisan in the Hebrew calendar throughout the world. This corresponds to late March or April in the Gregorian calendar. Passover lasts for seven days in Israel and eight days outside of Israel, with Jews outside of Israel holding two Seders (on the evening of the 15th and 16th of Nisan) and Jews in Israel holding one Seder (on the 15th of Nisan). Traditionally, families and friends gather in the evening to read the text of the Haggadah, an ancient work derived from the Mishnah. The Haggadah contains the narrative of the Israelite exodus from Egypt, special blessings and rituals, commentaries from the Talmud, and special Passover songs. Seder customs include telling the story, discussing the story, drinking four cups of wine, eating matzo, partaking of symbolic foods placed on the Passover Seder plate, and reclining in celebration of freedom. The Seder is performed in much the same way by Jews all over the world. * Do you have a favourite part of the Seder? * Matzo, love it or hate it? * What elements of your freedom would you miss the most if you were enslaved?